Researching all the marketing material, it is obvious that Swarovski Optik had a clear objective with the CL Companion series: The aim was to produce a compact, lightweight binocular at a lower price point that would appeal to a broader spectrum than their top tier models, but still retain as much of the exceptional precision and quality that they are renowned for and thus not cheapen their brand. The first part of the goal should be no problem for a company with as much expertise as Swarovski. 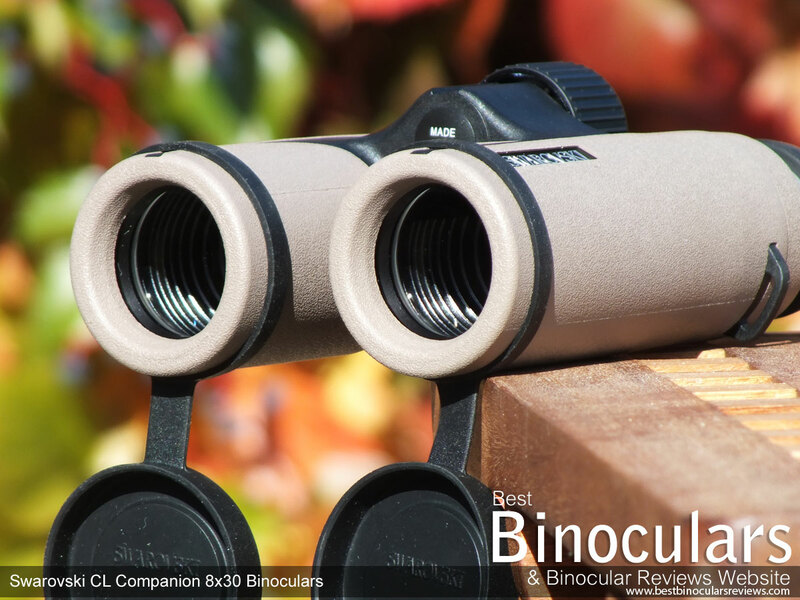 But producing a more affordable binocular without sacrificing too much on quality and performance is a very difficult balancing act to get right, especially with a brand like theirs where expectations from people like you and me are so high. So have they managed to pull it off? Well there is no doubt that these are cheaper than their leading models, but in achieving this, what compromises have they made and what have they had to sacrifice? 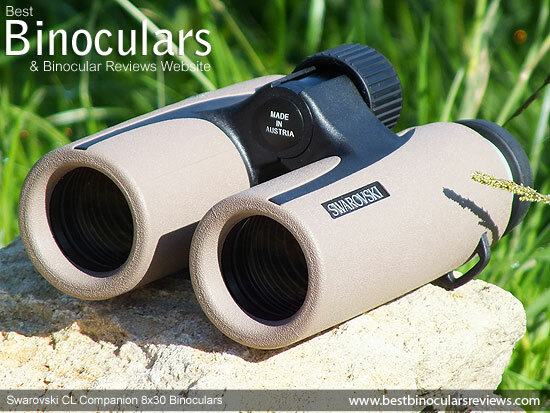 As well as this 8x30, the CL Companion also comes in a 10x30 configuration, both are available in black, green or the sand-brown color that I used for this review - note this model color is also sometimes referred to as the Swarovski CL Companion Traveler. 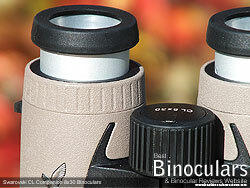 Before laying me eyes on them for the first time, I had a mid-sized binocular in mind. This is why as I took them out of their case, my first thought was just how small they looked and light they felt. The CL Companion is quite a bit smaller than most 32mm bins, but also a little larger than most full compacts (28mm objectives or smaller). It is almost the case of having to make a new category of sub-mid-sized bins, or oversized compacts to accommodate them! Unlike the EL, the CL Companion only uses a very thin single bridge to connect the two barrels, which is somewhat similar to their new SLC range and found on binoculars like the Vortex Razor HD which they call a "True Open Hinge". This design with fewer parts, no doubt helps in keeping the weight down and on a binocular this size also gives you just that bit more surface area on the barrels to hold onto which is important. For me an my rather average sized hands they felt really comfortable with the thumb intents under the barrels in just the right spot to do their bit to encourage you to hold them in the right way and at the right point to keep them nicely balanced. Whilst I could not test them with too much vigor (unfortunately they had to go back), this single bridge felt plenty strong enough and unless you do something pretty extreme, I am sure wont give you any problems. I think those with smaller hands will also really love these and will most probably find them nicer to hold than full-sized bins. The main framework on the CL is made from a mixture of polycarbonate and aluminium and this is where we find the first compromise to keep the price down. 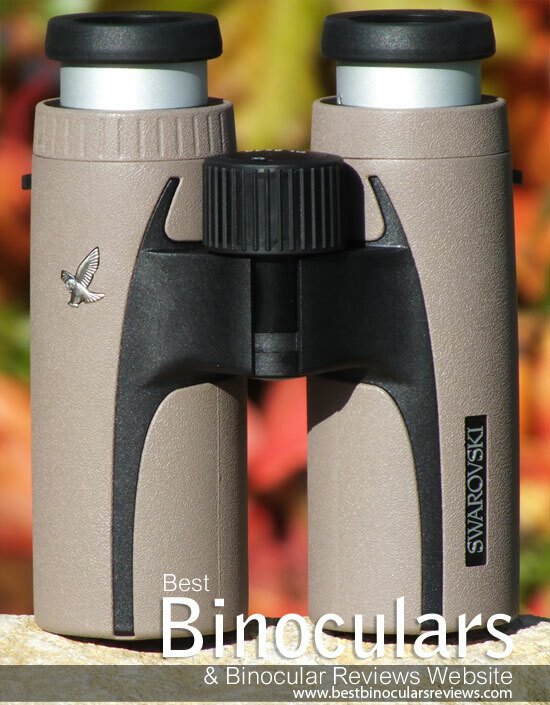 These days most top tier binoculars, including those from Swarovski use magnesium as the main housing material, which has a number of merits including being lighter and stronger, but it is also more expensive. However this is not to say that a polycarbonate and aluminium housing is bad, indeed Swaros more expensive SLC binoculars have used this very successfully up until very recently in their construction. Whilst polycarbonate and aluminium may be a little heavier than magnesium, a smaller instrument obviously uses less material to make it and so even though it is slightly heavier it does not make that much difference and going on my initial reaction as well as the facts, (view section on weight below) they have still managed to produce a very light device. So lighter would of course have been nicer, but sometimes as with these, it is not worth the extra money needed to achieve it. What is very obvious is that the 30mm objective lenses sit very deeply within the barrels - a full 12mm inside them in fact. I have been measuring this distance on all the reviews I do recently and this is by far deeper than any I have seen before as it is usually around 4 - 6mm. What this does mean is that they are very well protected against scratching and moisture in wet conditions. I use the Traveler or sand-brown version of the CL, that also available with a green or black colored outer armor. This rubberized armoring covers most of the barrels apart from a few details (see above) and does not extend to the central hinge. It is not nearly as thick or as tactile as on some bins I have used, but should provide enough protection for most smaller mishaps. It has been finely textured and so provides plenty of grip and although I never used them in the wet, I did try them with thick waterproof winter gloves on and had no issues what so ever. By opening and closing the central hinge, you can adjust the space between the eyecups to match the distance between your eyes. Swarovski advertise that you can adjust this interpupillary distance on these 8x30 CLs from a minimum of 56mm and fully opened, to a maximum of 74mm (this measurement is taken between the center points of the ocular lenses), which I measured and found to be 100% accurate. As you would expect on a binocular of this quality they have been sealed and are fully waterproof. Swarovski state that they have been submersion tested to a depth of 4 meters (13ft), which I was not about to test, so will just take their word for it. At any rate they should easily take even the wettest of weather conditions. By sealing the unit, it also prevents dust from entering which can be especially important it very dusty locations. When sealing, all internal air inside the unit is also replace with nitrogen gas. This prevents any internal fogging of the lenses that can occur with rapid temperature fluctuations. What is more, this now airless and completely dry environment makes it impossible for corrosion to occur or moss to grow, which is not that uncommon, especially with older bins. These are one of the real distinctive features on the CL Companions, the actual housing is made out of what looks like aluminium which has then been covered in a rubber coating. At 18mm in diameter, the ocular lens is smaller than what you find on most larger binoculars, which I guess is to be expected. The 15mm of eye-relief should be just enough to accommodate most standard eye-glasses and whilst there are no "fixed" intermediate stops, you can position the eyecups anywhere in-between full extended and retracted and they will stay at this setting even if you push against the eye-cup quite firmly. This gives you as a huge amount of flexibility (within the 15mm) in ensuring that you get exactly the correct amount of eye-relief for the perfect view. For what is essentially a large compact, at 30mm in diameter the CL still has a nice large focussing wheel that turned very smoothly with just a little friction (if possibly a fraction too much) to make accidental movement a non issue on my test pair. It's positioning also makes it nice and easy to reach and rotate without having to change your grip and because it well textured and prominent above the bridge, turning it even with thick gloves on was really simple. To me it looks like it is constructed of a hard plastic and then covered in a hard rubber coating and has a mechanism that is geared to take just over 1 full turn to focus from one extreme to the other. Here we find another small example of where Swarovski have sacrificed in a non critical area to save costs to produce a cheaper binocular. Their flagship ELs have an elaborate, but excellent diopter adjustment that is located within the central focussing wheel. 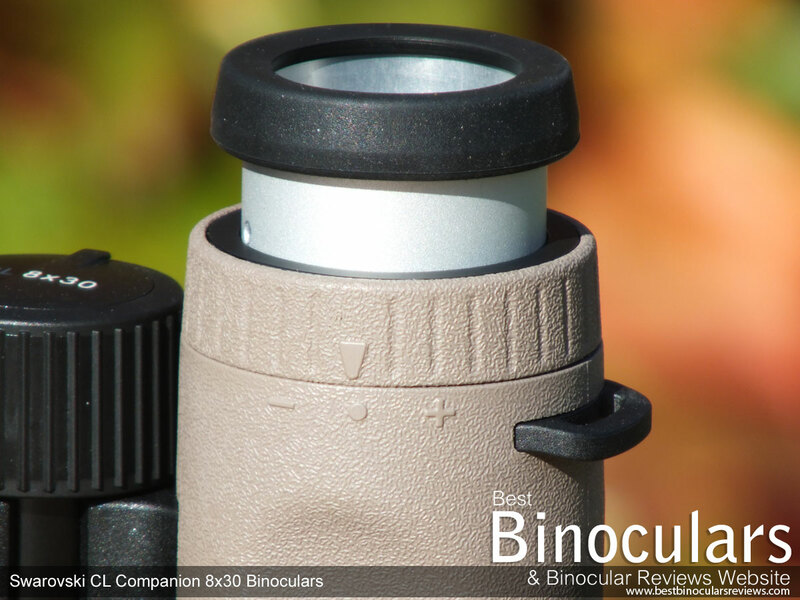 However on the CL, you will have to be content in the knowledge that to change your setting you will use the same method as on the majority of other binoculars - which is located between the eyepiece body on the right barrel. But as adjustment only (in theory) needs to be done once, when you first you first use your bins and only if your eyesight between your left and right eyes is different, then you will understand why I say that this really is not a critical omission. There is no ratchet or notches within the mechanism, but it was just tight enough to make accidental movement unlikely, but not too tight so as to make purposely adjusting it difficult. But remember most of these, apart from the Steiner have larger objective lenses. So depending on just how or where you categorise them, will change your perspective as to their weight being heavy or light. For me they handle and perform more like a mid-sized bin and so I will continue to describe them as being light. Their advertised dimensions are: Length: 11.9cm (4.70in), Width: 11.4cm (4.50in), Height: 5.8cm (2.30in). If you fully extend their eyecups, the length increases to 13cm (5.1in) and with the hinge closed or inter-pupillary distance set to it's minimum, their width is 10.1cm (4in). Like their weight, if we compare this to other mid-sized bins, they are very small, but the CL is quite a bit bigger than a true compact. Rather than quibbling about a few centimeters here or there, I feel what is important is they are comfortable to hold and easy to use like most 32mm bins, but because they are a bit bigger, are easier to adjust and less fiddly than a ultra-compact. Hiking & Walking Safaris - My bins are essential on most hikes and wildlife walks, but then so is my camera. Being able to put the binocular in your pocket when not in use so that it does not get caught up with your camera gear is why up until now I have always used a compact. This is where a lot of the money goes when developing and producing a higher spec binocular, but it is also where things often get a little murky as a lot of jargon and marketing hype gets thrown about. Manufacturers also quite often don't reveal everything they do and use, in a bit to keep it secret from their rivals. Even after a lot of research, I have not been able to find out any information as to what type of glass elements Swarovski Optik use for the objective or eyepiece lenses on these. This is a shame as I have a hunch that they are probably pretty good and so it is surprising that they don't shout about it a little more. What I am fairly certain of is, this is where they have made a few sacrifices in order to keep the cost of the CL down. The reason I say this is in the marketing of their SLC HD and their EL Swarovision ranges, they really emphasise the use of things like "HD" optics and Field Flattener lenses in the EL. This is absent in the CL marketing and so I assume is also absent in the product. So exactly what do they say? Once again, Swarovski don't actually mention the words "Fully multi-coated" anywhere when describing the CL Companions, but I think it is safe to assume that all lens surfaces that come into contact with air have had more than one layer of anti-reflection coatings (AF coatings) applied to them. As is very well demonstrated on the image on the right these coatings let more light pass through the lens as less is reflected away and with the same size lenses, more light will thus get through to your yes, which has the effect of generating a brighter view and consequently will perform better in poor light. Now, whilst this is all good, as you can imagine not all these coatings are created equal. On these and all other Swarovskis that rank above these, they have added their "own" recipe of coatings, which are known as Swarotop & Swarodur. 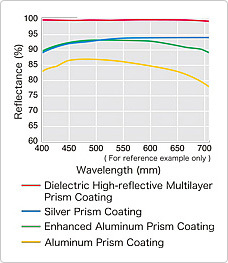 Developed and described by Swarovski as "multi-layered wide-band" anti-reflection coatings, they report that they unite the physical resilience of a typical AF coating with even greater transmission readings than ever before. They say their coatings are able to decrease the reflection over the whole light-wave spectrum on the exterior of the glass from approximately 4 to 6% on untreated glass to a tiny 0.2%. This is impressive as most my research indicates that most Multilayer AF Coatings are said to reduce it to about 0.5%. How are these added to the glass, well as with most standard AF Coatings, they are applied by vaporizing the glass surfaces of the prisms and lenses with exceptionally thin coats. If you want to know more, take a look at this really interesting video on How Binoculars are Made. Once again Swarovski are not very forthcoming in letting us know what glass is used in the making of the roof prisms on the CL, but I will assume that they are of a very high quality glass as the company does spend a lot of time and effort into improving them even further by applying expensive coatings which would not make sense on cheaper poor quality glass. Firstly the prisms are phase corrected: The roof prism design has many advantages over the porro prism, but one issue that it does have is something called "phase shift" that occurs at the opposing surfaces of the prism which has the effect of reducing the sharpness of the image. To correct this, coatings are applied to the glass which correct to keep the light waves in the correct color phases. These are known as phase correction coatings that are relatively expensive to apply and so are not found on all roof prism binoculars. The next issue with the roof prism system is that some light is lost on one of the surfaces on the first prism, or to put it another way, it does not provide 100% internal reflection. To counter this, highly reflective coatings are applied. Cheaper roof prism bins will use an aluminium mirror coating, whilst higher end bins use a silver mirror coating, whilst at the very top end of the market dielectric coatings are used... easy! What is not so easy is Swarovski only state that they use over 30 coats of their Swarobright coating. This is according to them "an innovative coating technology, enabling specific control firstly of the reflected light and thereby the colour properties." Phew, it sounds great, but once again I am really not able to expand much more on this other than to guess that by their description they do more than just reflect light and may even be a part of the phase correction coatings described above. Whatever they are exactly the company says that they have the effect of producing the "best colour fidelity and maximum light transparency." So whilst the figures above don't make for fantastic reading if you are a Swaro fan, I must say that in their defence and using the 8x30 CL Companion out in the field the FOV was really a non issue for me and I never had that tunnel feeling that you sometimes get with bins that have high magnifications and very narrow views. Swarovski Optik advertise the shortest focusing distance on the 8x30 CL Companion as being 3m / 9.8ft, but I measured it at 2.3m 7.54 feet on the one I was testing. On my scale, anything less than 6ft is excellent, so whilst these don't quite make that, they are not far off and so for occasional close up observation of subjects such as flowers, butterflies and other insects, these are more than adequate, but should this be your main interest, you probably should consider getting some very close focus bins. At 15mm, the exit pupil distance is good, but not brilliant however this should be enough for the average wearer of eyeglass wearer to still get a full view. In an effort to keep my observations and opinions as fair and consistent as possible, I use a number of control binoculars with which I compare the view against all the binoculars that I review. I use these controls to set the "standard" so from this I am able to gauge how well a binocular performs in a number of different areas relative to the standard and in this way I am able to ascertain if they are poor, average, good or excellent in a number of key areas. To check for image brightness, I compared the view through the Swarovski 8x30 CL Companion binocular with a number of my controls (different objective sizes) on a number of different occasions and in varying light conditions. In good light and as expected, I was really not able to say conclusively that one view was obviously brighter than another. However in low and very low light conditions the CL really performed well. They were noticeably brighter than my 8x32 control (I don't have a control 8x30) which enables me to rank their image brightness as excellent in comparison to other mid-sized bins. What I also thought was very impressive was that even in very poor light, the CL with it's 30mm objectives compared very well to my rather average 8x42mm control and I really struggles to identify the brighter pair. This just goes to show how it is not only how much light gets collected by the objective lens that is important, but how the quality of the glass and the coatings can make such a big difference in the the amount of light that finally gets transmitted to your eyes. For more on image brightness and why there are times when a smaller bin can seem as bright as one with much larger objectives, take a look at my Complete Guide to the Exit Pupil. I general use, I never noticed or was made aware of any obvious color fringing caused by chromatic distortion and even even looking for it by very closely studying the edges of white objects positioned in front of a dark background there were no noticeable fringing. I did notice a very slight purplish fringe when looking along the edges of dark objects whilst looking in the general direction of the sun. However this was no better or worse than any of my control binoculars. I would describe the amount of softening on the edges of the view as extremely minimal and as good as any binocular that I have ever looked through. This is always the part of a binocular review where I feel a little like a wine taster! This is because if you were just to look through these or indeed most other quality bins in isolation, you would most likely be impressed with the view, but probably not think too much about it. It is only when you quickly swap back and forth between two, that you can, over time, identify very slight differences. So whilst the variances are really very hard to spot (for me anyway), what did impress me was the vibrancy of the view through the CL Companion especially when looking into darker areas with a lot of shadows. They were also a little better at resolving very fine details as well as having just that bit more contrast than my controls, but not so much contrast that makes the image look unnatural. Compared to almost all true compacts (objectives of 28mm and under) that I have used, the quality of the view through these for me is as good as it gets with much improved low light performance to boot. Compared to mid-sized bins (usually with 32mm objectives) the optical quality of these ranks them up there with some of the best. And whilst it is not usually fair to compare a mid/compact with a full sized bin (objective about 42mm), I would rank them as good to very good if I could forget just how small they are. Even though they are fairly average bins, the fact that they matched the brightness of my 42mm control in very low light was particularly impressive. 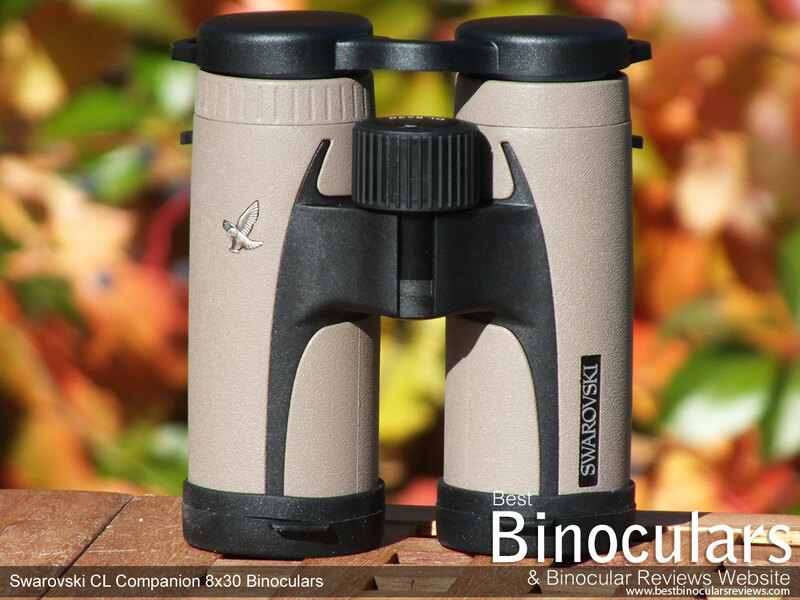 If you look below, you can quickly compare some of the most important specifications of this Swarovski CL 8x30 Companion binocular with that of some similar sized bins that I have also tested in the past. Please note: As you can see by the prices, the quality of the selection below varies widely, but I just wanted to demonstrate what kind of specifications that you can expect to find across a wide spectrum of prices and magnifications. The CL Companion is bundled with a carry bag (field bag), neck strap, wrist strap, and lens covers. This is one area that usually gets sacrificed by a manufacturer to save costs when producing a "better value" series. So it is interesting to note that whilst in general the quality of all these included extras (see individual breakdown below) is not quite high as those which come with the superior ranking models from Swarovski, they are still of a very high standard. Like all other Swaro bins that I have tested, the case that comes with the CL Companion is excellent. Whilst it is still technically a soft case, it has a number of semirigid supports within the walls of the bag that prevent it from completely collapsing. Within the bag there is plenty of cushioning and padding (especially at the rear) to provide ample protection for your investment. The interior is accessed by a large zipped opening that goes right around the front of the bag, which gives you a really good large opening when fully unzipped. The inside of the bag is roomy enough to make accessing and storing the bins nice and simple, even when you have the hinge fully opened. Another small but important detail is you can easily fasten the zip with the eye-cups fully extended and the lens covers in place. An annoying oversight which is all too often forgotten. On the inside front wall there is a fairly large pocket, which can be used to keep a few small items and your field cleaning cloth. The field bag does not have its own strap and though it is possible to use the neck strap of the binocular when it is stored in the case by partly leaving the zip open, it is not really designed for this and you obviously cant carry the bag in this way without the bins being inside it. This does not bother me as I very rarely carry a bag and my bins with me together, but may be frustrating to some. What may help is at the rear is a loop which you use to thread a belt through to carry the bag on your hip. Although it does not include the quick release length adjustment tab as found on the EL models, the CL Companion carry strap is still excellent and as good as or better than any I have seen on an instrument of this size. Why do I say this, well looking at it closely, it is obviously really well made, using quality materials that includes a neoprene padded section and leather connectors that join the straps to the padding. The neoprene is nice and thick (approx. 5mm) and is 4.2cm wide at the point that goes around your neck and shoulders, which will also help to distribute the weight over a wide area. What is more, it is shaped and curved to fit even more comfortably. The strap attaches to the binocular in the usual way of threading it through the loops on the binocular and then back on itself. I do like the inclusion of a wrist strap, which shows some really good attention to detail and something that I have only really seen on compact porro prisms before now. On a small and featherweight bin like these, it is not always necessary to have a neck strap and if like me you sometimes prefer to store your bins in a jacket pocket, not having the neck strap attached to them makes this far easier. Then when in use, you have the added security of being able to tether them to your wrist. It is connected to the bin by simply threading and looping it through one of the eyelets on the side of the Companion. Made from a soft plastic, the rain-guard (eye-piece cover) fits over and attaches to the eyecups snugly enough to ensure that they wont easily come away accidentally, but are not too tight which would make taking them on and off difficult. The guard has two eyelets for threading the carry strap through and a flexible bridge between the cups, which enables them to be attached no matter what your inter-pupillary distance is set at. Whilst the CL Companion has a more than adequate rain-guard, this is an example of where Swarovski have cut costs, for example higher ranking EL Traveler comes with one of the best rain guards that I have ever seen. The lens covers are made from rubber and just like the rain-guard, fit really well. 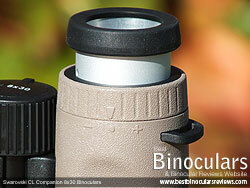 Each has a loop that you fit over the ends of the barrel to attach them to the binocular. This is a feature that is quite common now and is something that I personally like as it ensures that your caps are harder to loose and always handy so that you never forget to protect your lenses from scratching and dirt when not using your bins. .. included is a very high quality micro-fibre lens cleaning cloth that is suitable for cleaning both their objective and ocular lenses and as with their other models, you also get a moistened disposable cleaning tissue which is a nice touch. Furthermore you will find an instruction booklet that is thick, but covers ten different languages with each only covering basic information like the parts of the device, fitting the strap and wrist strap, adjusting the eye cups, interpupillary distance correction, focusing, dioptric compensation, storage and cleaning. In a pocket on the inside cover is a pull out sheet that contains all the major statistics of the CL Series. You can download a digital version of both of these below. The warranty is located on the back cover of the instruction booklet: Swarovski offers a limited lifetime warranty for all the CL Companion Bins. I began this review wondering if, with the CL Companion series, Swarovski Optik could achieve their goal of delivering a compact and lightweight binocular that is less expensive than their elite models to open up their brand to a wider audience, but still hold on to as much high end performance & build quality that they are famous for. Well I have to say that in my opinion they have pulled it off really well. Something had to give and whilst the the 8x30 CL may not quite match every single feature and spec of their higher ranking 8x32 EL for example, unless you were to compare them side by side, the only real obvious difference you would immediately notice would be big difference in the price tag! 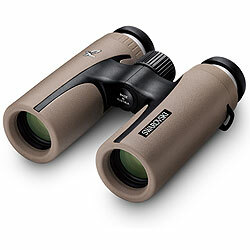 What I really like is that they have not compromised that much at all and where they have it is mostly in areas that are not that critical meaning these 8x30 CL Companion binoculars still look, feel and perform as you would expect from a Swarovski binocular which is excellent. Weak points? Whilst it is by no means bad, I would have preferred to have had a wider view when looking through them. 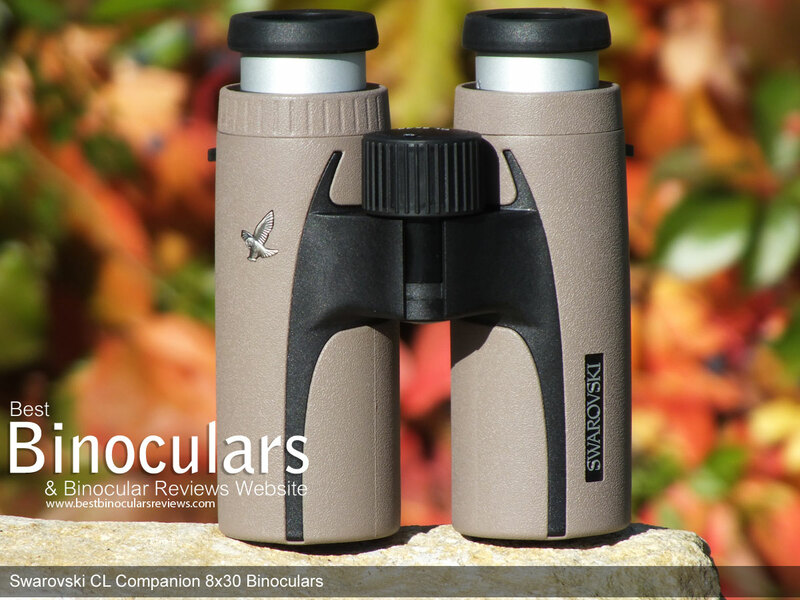 These are lightweight, compact binoculars with very high performance levels - there actually very few areas where they will not perform at least reasonably well. Their size and weight make them ideal for travel, especially on safaris, camping and hiking where space is a premium. I really do like the fact that they are a bit smaller than most mid-sized bins and so they can fit into a reasonably large jacket pocket. This means keeping them out of sight, which is sometimes important when travelling, but it also frees both hands, so when on a walking safari, bird walk or hike, you can also carry a camera with you without the irritation and complication of a bin hanging around your neck all the time. Another area where their small size and being able to tuck them into your pocket is a real bonus is at most outdoor sporting events, with their reasonably wide view, they are perfect for watching golf, motorsports, cricket, tennis, rugby football, horse racing etc. Whilst they nor indeed any other compact can match a similar quality, full-sized 8x42 binocular in terms of overall optical performance (esp in low light) and field of view, they easily perform well enough for me to recommend them as a very good compact general wildlife observation and birding binocular as they will outperform most others of a similar size. 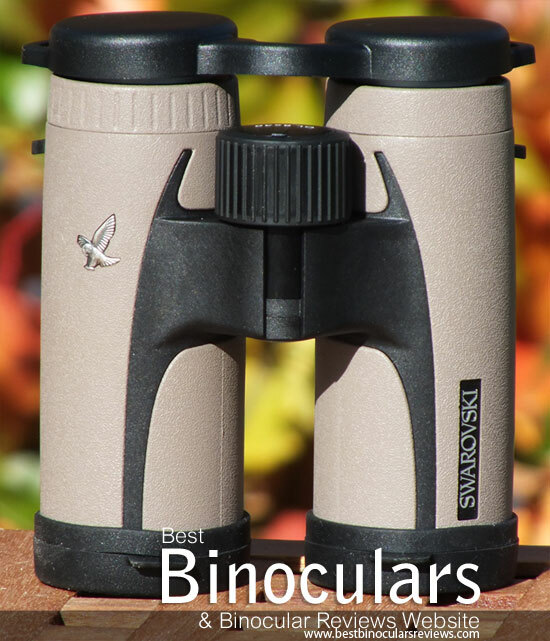 Once again going back to their size, the ease at which they can be held and adding to that their very close minimum interpupillary distance these will really suit those with smaller hands making them ideal women's binoculars. Hunters who also carry a bunch of other gear, but who want to travel light as possible will also value being able to quickly and easily tuck these away into their jacket pocket. The CL is waterproof, tough and has a non shiny camouflaged coloring, which has obvious benefits in many outdoor situations especially hunting. 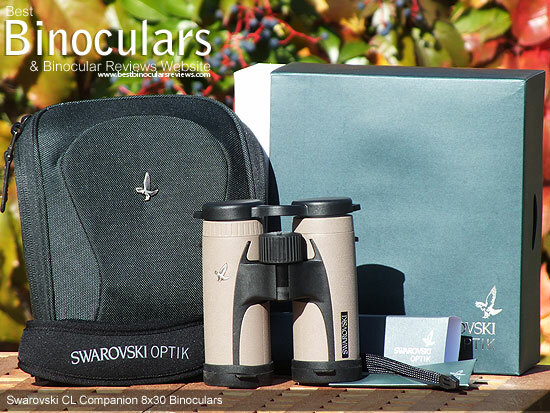 I would like to thank Swarovski Optik for sending me these to review, but I also want to make it clear that just like all the other articles and reviews on this site, the opinions I have expressed are my truthful and honest feelings and thoughts of the bin and I am in no way influenced by the manufacturer, their distributors or any suppliers.